If you have been searching high and low for a unique Father’s Day gift idea, you have come to the right place! We have an ultra-cute twist on your typical Father’s Day celebration. Start a Father’s Day tradition that is sure to make any dad feel loved and appreciated–Father’s Day Eve! Every Father’s Day, instead of celebrating Dad only on Sunday – which is typically spent splitting time at church, and visiting multiple dads, in-laws, grandpas – also celebrate “Father’s Day Eve” on Saturday. This will be a Father’s Day tradition and celebration that he will look forward to all year! Create your own Father’s Day Eve Tradition by making it his day, ALL DAY! Every hour of the day will be planned out with either a sweet, small gift or a little activity for Dad to do and enjoy! Every year, Father’s day rolls around and you scramble to find something Dad would actually want, or that he would truly appreciate. Dads can be hard to shop for! Sentimental gifts can be difficult to find. Father’s Day ideas offered on Pinterest or social media are often not quite the right fit for the dad in your life. (If you want to add this one to your own Pinterest board, though, you should go right ahead!) You need something thoughtful, useful, funny, sweet–all while not being too cheesy! It seems impossible! So you end up just searching Amazon and buying him another new tie… Does this sound familiar?! Oh, the woes of Father’s Day gift-giving are all too common! This year, start a new Father’s Day tradition! We’re here to rescue you from the boring tie Father’s Day gift this year! What is more sweet and thoughtful than gifting Dad an entire DAY? Father’s Day Eve is his day–ALL DAY. How often does he get all the attention? How often is it all about him? The great part is, this gift is also useful! The tags allow you to still get him gifts to go along with each tag. It’s almost like a gift guide, but you can personalize the tags to his interests and preferences! Dare I say this is the perfect Father’s Day idea?? It fits any dad! Turn Father’s Day Eve into a Father’s Day tradition that he can look forward to every year! Did you hear that? THIS can be the idea that frees you from the last minute Father’s Day gift-giving scramble every year! Now that is the real victory! Dad feels loved and you have a great Father’s Day gift every year! The best part about this Father’s Day tradition is how great it looks when it’s all put together! The printables are too cute, thanks to Carisa from Messes to Memories! Let’s get started spoiling Dad on Father’s Day Eve! Do not forget to mark your calendar! You are used to celebrating Father’s Day on Sunday, but this year you will need to plan for the greatest day of the year, Father’s Day EVE, on Saturday! Celebrating on Saturday will allow Dad to have the entire day all to himself. He will feel so loved and will love to have an entire day to simply enjoy himself! Normal Saturdays may consist of work or completing tasks around the house and for everyone else, but this one is special! Father’s Day Eve is a holiday just for him! The day will allow you all to spend time together, let him have some much-needed downtime, and of course, spoil him with your love (…and treats). To get this Father’s Day tradition started, first, print out the printables. There are multiple tags you can use and a card to get it all started! 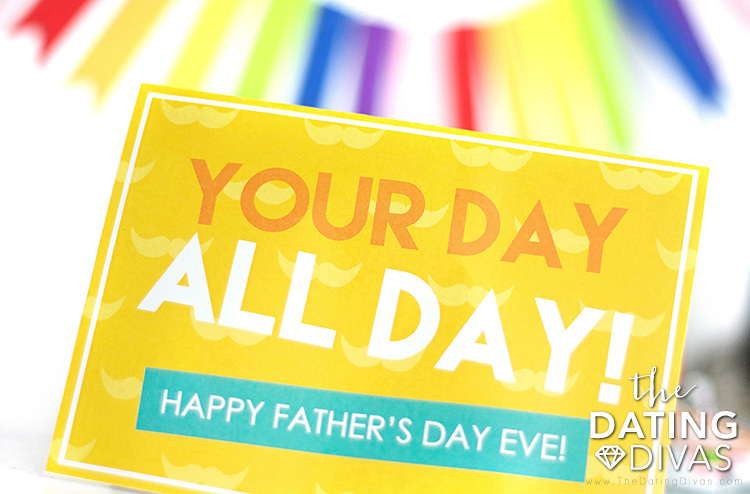 Use the card to explain what this new Father’s Day Eve Tradition is all about! Tell Dad, it’s YOUR DAY, ALL DAY! 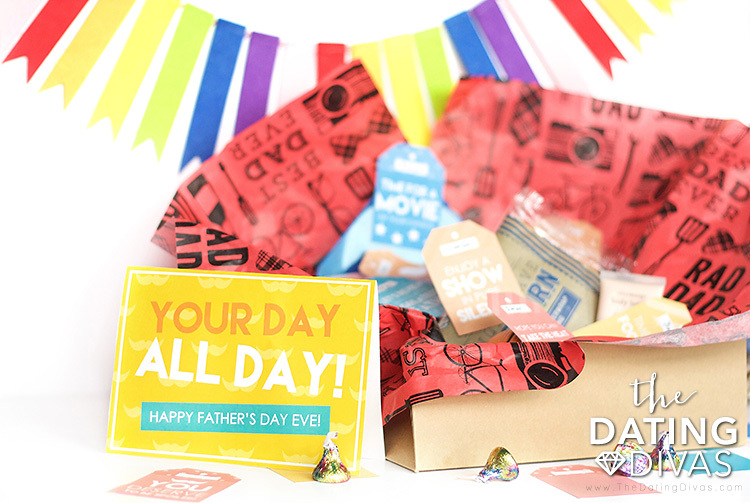 Tell him every single hour of the day will be filled with Father’s Day activities, Father’s Day gifts, and of course a heavy dose of Dad Day love! So let’s get to it! To make this Father’s Day Tradition something Dad looks forward to all year, use the tags to create your own personalized Father’s Day gift. By grabbing a few items to go with the tags you will have created both a thoughtful Father’s Day gift and a day full of fun and celebration! There are a dozen printable tags to give you ideas. 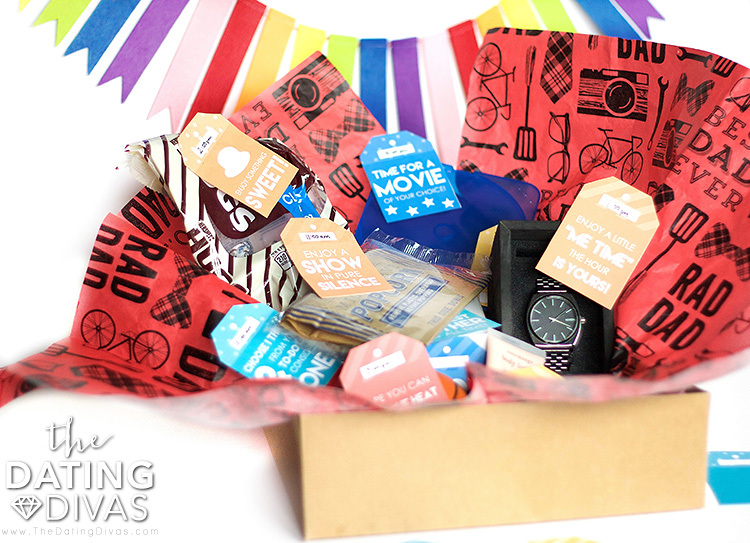 Use the tags as a gift guide, personalizing the tag by attaching it to a small gift dad would love! 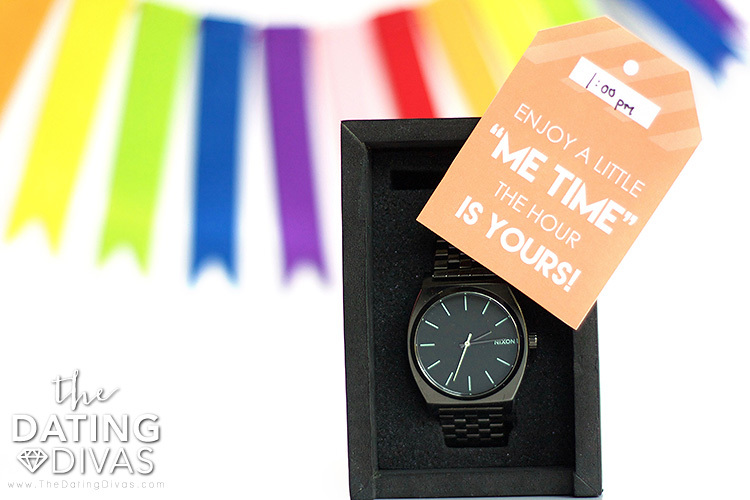 Simply print the tags, and write in the time of day he will be able to open the surprise Father’s Day gift or write in the hour in which an enjoyable activity will be taking place. If you have your own great ideas and you want to personalize your own tags, we’ve got you covered there as well! Print off the blank tags on the last page and fill them in yourself! This idea is fool-proof! Perfect for the most serious dad, to the silliest dad, and all the variation of dads in between! 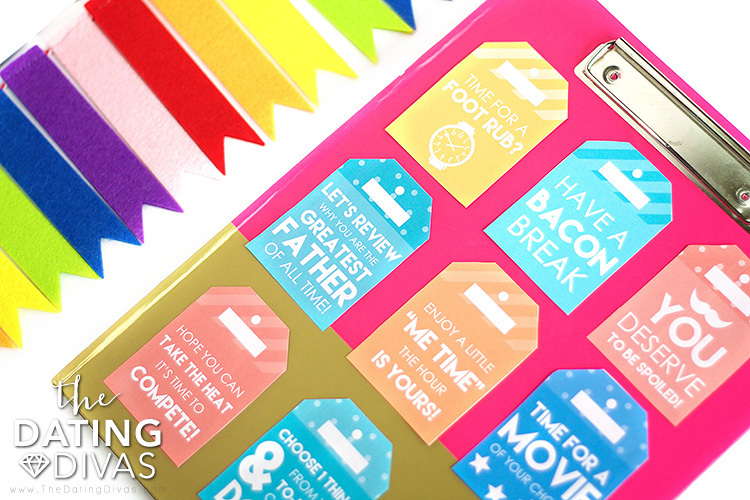 There are made-for-you tags and blank tags that you can fill in with your own great ideas! 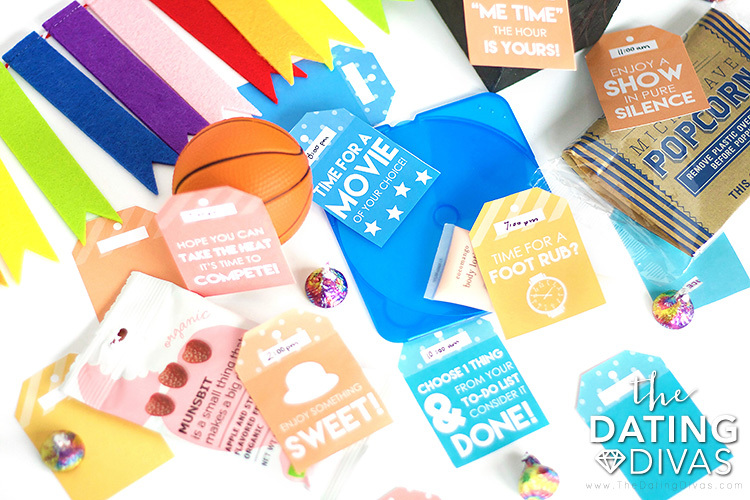 The made-for-you tags have activities, gifts, and ideas to fill your Father’s Day Eve with! The tags we provided are very open to interpretation so that you can personalize this Father’s Day tradition to your own dad! To get your creative juices flowing we’ll give you several ideas to get you on the right track as you prepare for Father’s Day Eve. 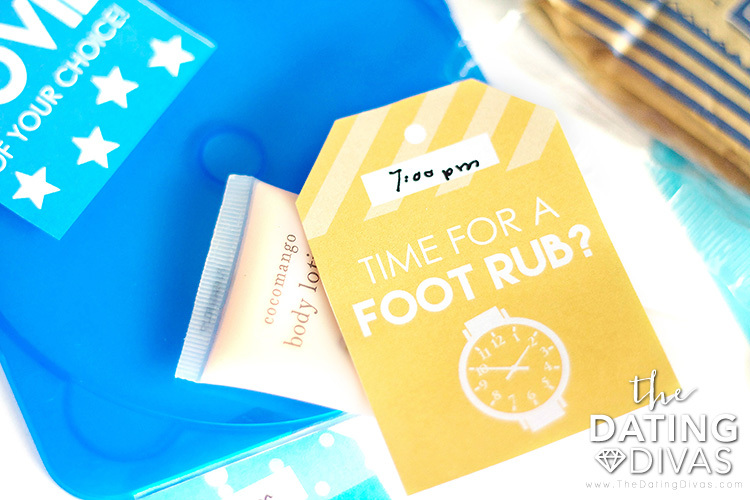 For the foot rub tag, include a bottle of lotion or a hand-held massager to attach to the tag! When it’s time for him to have a bacon break, deliver him a plate of bacon or get him bacon socks, you could even make a bouquet of bacon roses! To the tag granting him a little “me time”, you could set up a nook for him to read or work, or go all out with the gift giving and include a new watch! Look for the tag granting Dad a show in pure silence. Tell me that doesn’t sound heavenly! You could attach a cozy blanket or a new pillow for his viewing pleasure… or you could just have Netflix all cued up and ready in his room! What dad doesn’t love to get some competitive juices flowing? 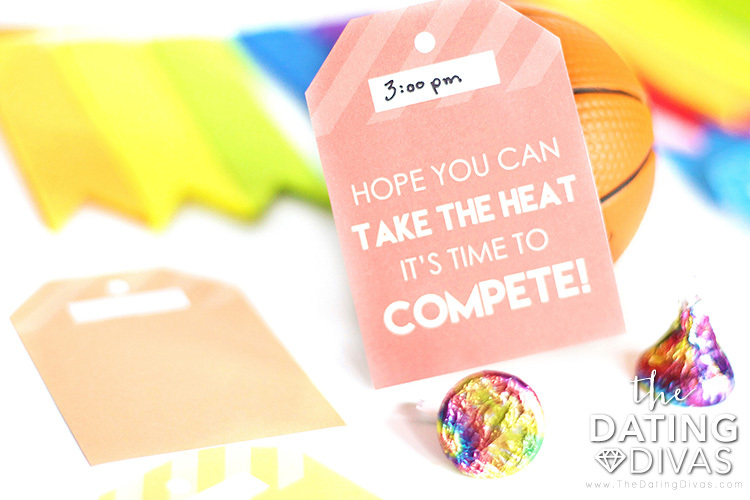 When it’s time to turn up the heat because you give Dad the tag that tells him it’s time to compete, give him nerf guns or head outside for a basketball game and make him show you what he’s got! Of course, what Father’s Day is complete without a great breakfast?! Make him his favorite that he rarely gets, or make him breakfast in bed! One of my personal favorite tags lets Dad choose one item from his to-do list and you help him complete it! Maybe you can anticipate what he will be wanting help with and you can grab some new supplies to go with the tag. Perhaps, car washing supplies, or new gardening gloves for pulling weeds. For the tag that says, “You deserve to be spoiled” you could attach a gift or a treat that he loves. When it’s time for the tag letting Dad choose the movie, snuggle up and enjoy watching another sports legend movie for the bazillionth time as he quotes every word. There is even a tag for a “silly surprise”. Make up a song about Dad, or even a funny little dance to make him laugh. Finally, write a note or tell him aloud all the reasons he is the greatest father of all time. That is the final made-for-you tag on the page and a great way to wrap up a very memorable Father’s Day Eve! These are just a handful of ideas to get your creativity flowing. Personalize your Father’s Day Eve Tradition specifically for your Dad! Having every hour of the day dedicated to him will be a luxurious Father’s Day tradition that will be a huge hit every year. It’s good for Dad to get all of the attention for the day. This will be a Father’s Day celebration he will never forget!